Seismic plates help ground and balance your warehouse shelving. Without them, you could have a disaster on your hands. When you hear “seismic plates,” naturally you think of earthquakes. While Maryland may not be in an earthquake-prone area and there are no hard and fast regulations from OSHA about them, there are still many reasons to invest in seismic plates for your warehouse shelving. Despite no specific OSHA standard for anchoring rack systems, OSHA does have the General Duty Clause 5(a)(1) that says: “Employers are required to provide their employees with a place of employment that is free from recognizable hazards that are causing or likely to cause death or serious harm to employees.” Any shelving or rack system that isn’t properly secured to the floor is a potential hazard. Seismic plates balance the shelving so that weight can be evenly distributed. Just as you build a foundation for a house that is made of heavy duty concrete, the heavy-duty steel of the seismic plates provides a wider base for the legs of the rack system, resulting in better stability. In addition, wider base makes the rack sturdier, to prevent buckling of the beams under the weight of the inventory. Uneven weight distribution can cause twisting of the rack’s legs and floor plates. Seismic plates help to prevent twisting. The heavier the load, the more likely it is to bear down on the base of the rack system. Seismic plates help secure the shelving legs to the ground. Rack system installers should follow the equipment manufacturer’s installation instructions and keep up with maintenance as described by the manufacturer. Foot plates must be anchored to the floor from the front and the back for maximum effectiveness. Not doing so will cause damage to the entire unit and can even be a hazard to the product being stored and the employees working with it. Use the right screws and fasteners – they should come with the foot plates and screw easily and snugly into the plate holes. Rack systems should be inspected at least once year. The footplates should be among the items on the checklist. Look for missing, loose or sheered anchors; anchoring on two opposite sides of the footplate for balance and missing seismic plates. All of the rack systems in your warehouse should be inspected by a professional inspector, both at installment and regularly thereafter. In addition, it’s a good idea to designate a “safety person” on your employee team who will inspect the shelving on a regular basis and complete a checklist that includes review of the seismic plates. OSHA has two primary regulations that apply to storage racks: stored items must be secured to keep materials from falling over or collapsing; and there must be 18 inches between the top of the racked materials and the sprinkler system. The General Duty clause covers everything else, because it compels employers to be responsible for providing a safe work place. The workplace can be safer with the use of seismic plates. When purchasing used rack systems or equipment, check out the foot pieces. If there aren’t any, either invest in some new ones or skip that particular system, no matter how tempting a price. It’s not worth risking the safety of your product and employees. 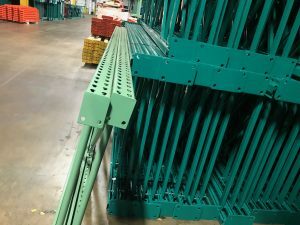 If the rack was previously used without seismic plates, be sure to investigate its beams and shelving for signs of wear and tear, like bent beams and legs, sagging shelving or twisted and shaved sections on the legs closest to the ground. If you have invested in the peace of mind of seismic plates, that shaking back and forth that is rarely, if ever, felt in Maryland won’t be troublesome to you. You can enjoy the ride.